Ancylostoma duodenale and Necator americanus are the two hookworms most often seen in humans. 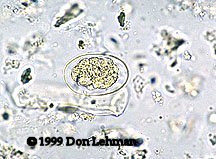 Although the adult form of these intestinal nematodes can be distinguished, the diagnotic form in humans, the ova, are essentially identical. The ova are oval and measure about 60 by 40 µm. There is typically a clear space between the embryo and the thin shell. This is an unstained wet-prep.